Create a lasting impression with beautiful custom swing tags made from the finest Italian Nappa leather in either a smooth or textured finish, or from a faux leather alternative. Perfect for adding an original finishing touch to gifts, handmade items or even your own fashion line, they ooze sophistication. Stand out and choose a 10-pack of leather labels for your crafty projects. Swing tags, UK made and printed to order, in four different sizes. Made from beautiful Italian Nappa leather, choose to personalise your leather labels with a design, photos, text or logo. All tags are printed on one side and hole punched in the corner to accommodate the 150mm silver ball chain or ribbon you receive with each label. You can also select 'none' if you'd prefer to use your own hanging method. The other side is left unfinished, leaving the natural velvety texture of the leather. They come in packs of 10, and each tag can be printed with the same or a different design. The leather swing tags and woven tags are of great quality. My design looks beautiful...very professional. Customer service is great and turnaround time is extremely quick. I’m extremely pleased with my purchase and will definitely purchase again. Very quick process and labels arrived very quickly. Great quality. Had exactly what I was looking for, and ordering was easy. Product quality is great and so is the service.... I am very happy and will always use as my first point of call. Our leather swing tags are available in a multipack of 10 so you can stock up for future projects or just personalise a few special ones. 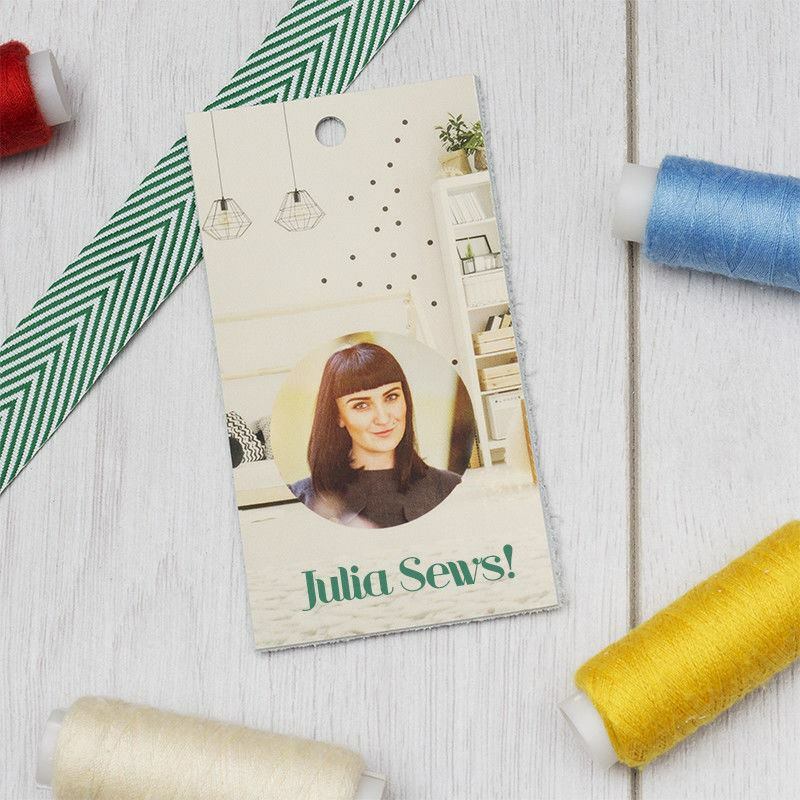 Go one step further and stand out from the crowd and design your own swing tags. Click start design and upload your image. We source the finest Italian Nappa leather, so each individual leather tag is totally unique, featuring different variations of the natural grain. We print your custom swing tag designs onto the sheet of leather and manually cut the amount you order. The print is long-lasting, and colours have a beautiful, finish. You can design each individual tag so they're all different, or choose to print all tags with the same design. Because it's a natural product, the face will have visible grain and pockmarks. Over time, they'll develop a subtle cracked patina, and all of this simply adds to the authentic charm of leather. Perfect for craft and DIY lovers, these sweetly personalised leather labels are ideal for gift wrapping. Once you've finished wrapping, simply attach to a bow for a final touch of love. If you make homemade wine as a hobby, attach a leather tag around the nape of the bottle featuring a little description about the care and love that went into each bottle. Fitted with a metal chain or ribbon for easy attachment, create a design from the heart to show your friends and family just how much you care. You can use these as fashion swing tags, ideal for showcasing your clothing brand logo and garment details. Choose from XS, S, M or L and put that professional touch that customers can't help but remember. Not just any old label you discard, these luxury swing tags can double as a business card for your fashion line, incentivising people to keep them for future reference. Because each leather tag can be customised with a different print, you can include special offers, limited edition prices or different sizes into your design.